Life science research in the U.S. is typically funded through a variety of sources ranging from government, foundations and philanthropists to traditional private financing and capital markets. This report will focus on life science research in the state of Washington that has been funded by government, local foundations and select philanthropists for the period from 1980-2014, a period that coincides with the founding and development of the modern biotechnology industry (Image: WA Life Science Evolution - a genealogy poster that illustrates the "technology origins" of more than 300 life science firms and non-profit organizations located in the state of Washington). Washington State's life science industry, like other leading life science centers in the U.S., was founded in large part on research conducted at the state's universities and non-profit institutions, and funded through grants, contracts, and federal research and training awards. 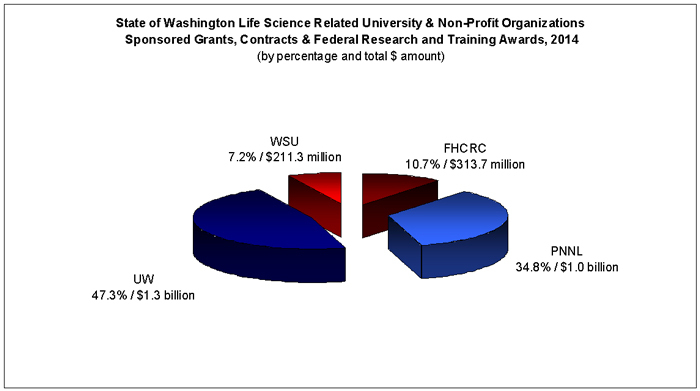 However, the reasons why Washington state, and in particular the University of Washington, and Pacific Northwest National Laboratory are such large recipients of federal largesse, and why the Fred Hutchinson Cancer Research Center exists at all, predate most of the researchers working in the state's life science industry, as well as the state's elected representatives. Washington's life science industry, like other leading life science centers in the U.S., also was founded on the work of visionary political leadership, specifically that of Senators Warren Magnuson and Henry Jackson who represented their state in the U.S. Congress for a combined total of eighty-nine years (1934-1983). Nicknamed the "Gold Dust Twins" for their ability to obtain federal funding, their rise to seniority leadership in Congress resulted in a growing stream of federal dollars into Washington state and the Pacific Northwest region that continues to have a significant impact today. 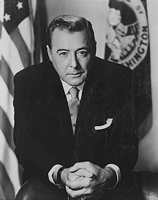 In fact, it can be argued that the very foundation of our nation's life science industry is due in part to the work of Senator Magnuson who, in 1937, introduced legislation creating the National Cancer Institute (NCI), and in 1945 introduced a bill to create a National Research Foundation, now known as the National Institutes of Health (NIH). In 1979, in honor of their loyal senatorial supporter, the NIH Clinical Center in Bethesda, Maryland was renamed the Warren G. Magnuson Clinical Center. Locally, Senators Magnuson and Jackson were instrumental in directing the flow of federal funds into the the state's universities, and the Hanford Site in Richland, now known as Pacific Northwest National Laboratory. In 1972, Senator Magnuson helped secure federal funds through the NCI to establish the Fred Hutchinson Cancer Research Center, and in 1978 the UW Medical Center was renamed the Magnuson Health Sciences Center, honoring the state's powerful senator whose accomplishments a half century ago continue to impact life science research locally, as well as nationally (Photos: Warren G. Magnuson and Henry Jackson courtesy U.S. Senate Historical Office). Today, the NIH is the nation’s medical research agency and the leading supporter of biomedical research in the world. Due in large measure to NIH research, a person born in the U.S. today can expect to live nearly 30 years longer than someone born in 1900. More than 80% of the NIH's funding is awarded through almost 50,000 competitive grants to more than 300,000 researchers at more than 2,500 universities, medical schools, and other research institutions in every state, as well as around the world. About 10% of the NIH's budget supports projects conducted by nearly 6,000 scientists in its own laboratories, most of which are on the NIH's Bethesda campus. 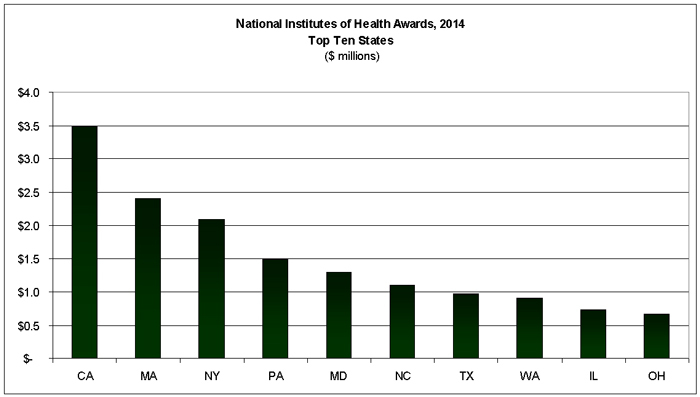 In 2014, the state of Washington was the eighth largest recipient of awards from the NIH ($910 million), a position it has held for the past decade. 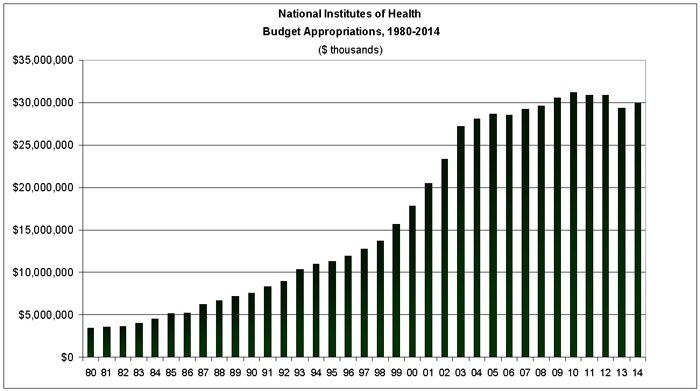 The NIH budget from 1990-2004 was a period of budget stability and record growth averaging a 6% annual growth rate. From 2005-2014, however, the NIH budget was essentially flat with a meager growth rate of 0.8 percent annually, and department budgets eroded by inflation were worsened by the impact of sequestration in FY 2013, an automatic, across-the-board 5.5% cut in NIH support. The total NIH program level in fiscal year (FY) 2014 was $29.9 billion, an increase of $600 million or a 2.0% increase over the $29.3 billion appropriated in FY 2013. Today, NIH’s purchasing power has been cut by almost 25% compared to a decade ago (Source: NIH, Appropriations History by Institute/Center (1938 to Present). A growing source of funding for non-profit organizations and private companies alike, nationwide and in the Pacific Northwest, are foundations and philanthropists. Fortunately, Seattle has a long history of philanthropic giving in the health- and life-sciences. Children’s Orthopedic Hospital Association, now known as Seattle Children's Hospital and Regional Medical Center, was founded In 1907 with the financial support of the James and Anna Clise family, one of Seattle’s leading real-estate developers and financiers. In 1898, tragedy struck the Clise family when their youngest son, 6-year-old Willis succumbed to an untreatable inflammatory rheumatism. At the time, the closest children’s hospital was in San Francisco. Out of this tragedy, Anna Clise, with her family and other Seattle community leaders founded the Children’s Orthopedic Hospital Association, the first pediatric facility in the Northwest. Today, Children's Hospital and Regional Medical Center occupies a 24-acre site in Seattle's Laurelhurst neighborhood and serves as the pediatric referral center for Washington, Alaska, Montana and Idaho. Additionally, the Seattle Children’s Hospital Research Institute was founded in 2006 to "treat, prevent and eliminate childhood disease." Leading the way in 21st century philanthropy is the Seattle-based Bill & Melinda Gates Foundation, the largest philanthropic foundation in the U.S. with an endowment of $43.5 billion, total direct grantee support of more than $3.9 billion in 2014 and total grants since inception of $32.9 billion. Local life science Gates Foundation grantees include: the Fred Hutchinson Cancer Research Center, PATH, and Seattle BioMed, all internationally renown organizations supporting improved healthcare in the developing world. Another important factor in the Seattle arena of philanthropic giving is the Microsoft Corporation, headquartered in Redmond, WA, a suburb of Seattle. Microsoft co-founders Bill Gates and Paul Allen are among the wealthiest individuals in the world. According to "Forbes" magazine (2014), Gates alone is worth an estimated $81.4 billion dollars, and Paul Allen $22 billion dollars. In addition, it is estimated that Microsoft, through stock options granted employees, has produced more than 5,000 millionaires, most of whom live in the Seattle area. An example of Gates' local impact was the recruitment in 1991 of Leroy Hood from Caltech to the University of Washington (UW). Dr. Hood, best known for his work developing automatic gene sequencing machines, was appointed Chair of the newly created Department of Molecular Biotechnology. Notably, the recruitment of Hood was made possible by a $12 million gift to the UW from Bill Gates that was used to found the new department within the UW's medical school. Subsequently, Dr. Hood recruited a number of leading scientific researchers to the UW, and has been involved in the founding of several Seattle area life science companies, including the establishment in 2000 of the Institute for Systems Biology, a non-profit institution located on the shores of Seattle’s Lake Union. Allen’s impact is also visible on Lake Union where the Allen Institute for Brain Science was launched in 2003 with seed funding of $100 million from the Microsoft co-founder. In 2007, Allen committed another $100 million, and in 2012 contributed an additional $300 million to further the institute’s mission. The Allen Institute is also supported by government, foundation and private funds to facilitate its projects. Seattle’s newest research institute, the Allen Institute for Cell Science, was launched in December 2014 with a $100 million contribution from Mr. Allen. The new Institute for Cell Science will serve as a catalyzing force that will integrate diverse technologies to study the cell as an integrated system. Other notable PNW-based philanthropists and life science investors include: Jack Benaroya, founder of the Benaroya Company; Jeff Bezos, founder and CEO of Amazon; and Phil Knight, co-founder and chairman of Nike, located in Beaverton, Oregon. The Jack Benaroya family has long been a financial supporter of the Virginia Mason Medical Center, and in 1997 after receiving a $3.5 million donation from the Benaroya Foundation, Virginia Mason renamed its new medical research building the Benaroya Research Institute at Virginia Mason. Jeff and MacKenzie Bezos, both Princeton alumni donated $15 million in 2011 to the Princeton Neuroscience Institute, creating the Bezos Center for Neural Circuit Dynamics. In the 2014, the Bezos' invested $25 million in Seattle-based Juno Therapeutics, and donated $20 million to Fred Hutchinson Cancer Research Center to explore the potential of immunotherapies for treating lung, colon, breast and other common solid-tumor cancers. The most recent Hutch donation follows a catalytic $10 million challenge gift the Bezos family made in 2009 to support immunotherapy research. South of the border in Portland, Phil Knight pledged $100 million in 2008 to the Oregon Health & Science University Cancer Institute (OHSU), the largest gift in OHSU history. The university subsequently renamed the organization the "OHSU Knight Cancer Institute." In 2013, Knight announced his intention to donate $500 million for research if OHSU could match the amount over the subsequent two years. It has been said that one of the big advantages for future life science funding in the Pacific Northwest will be when all of the Microsoft millionaires get old and discover the life saving benefits of life science technology. If the preceding is indicative of what we may expect with philanthropic giving in the future, the Seattle area and Washington state, as a whole, are very fortunate to have companies like Microsoft, Amazon and others located in the region. Today, more than thirty non-profit institutions and universities in Washington state are engaged in life science research. This report includes data from the state's two largest universities, the University of Washington, and Washington State University, and select leading non-profit institutions, including: Allen Institute for Brain Science, Allen Institute for Cell Science, Benaroya Research Institute at Virginia Mason, Fred Hutchinson Cancer Research Center, Institute for Systems Biology, Pacific Northwest Diabetes Research Institute, Pacific Northwest National Laboratory, Program for Appropriate Technology in Health (PATH), Seattle BioMed, and Seattle Children's Hospital and Regional Medical Center. Notably, of the more than 300 life science firms in the state, one-quarter are founded on technologies developed at these research institutions. Since 1980, these universities and non-profit organizations have attracted over $56 billion into Washington State -- mostly federal research and training awards focused on health science- and environmental-related basic research -- more than $3.4 billion in 2014 alone. During FY 2014, the University of Washington, Washington State University, Fred Hutchinson Cancer Research Center and Pacific Northwest National Laboratory combined brought $2.9 billion in grant and contract awards into the state of Washington, an increase of $244 million or +9.1% compared to the $2.685 billion these same institutions received in FY 2013. The state's two largest universities, the University of Washington (UW) and Washington State University (WSU) have together attracted more than $26.2 billion into the state since 1980. 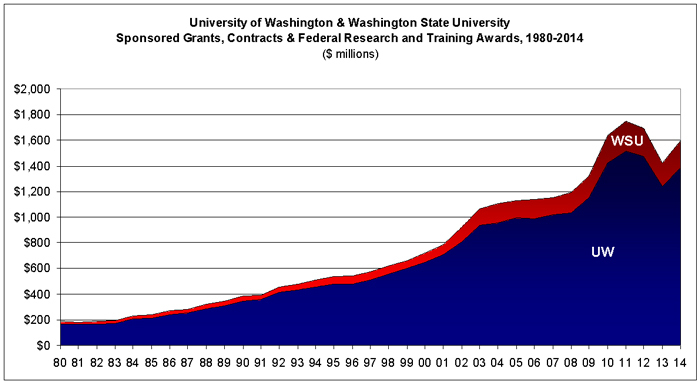 During the FY ending June 30, 2014, the UW and WSU received a total of $1.5 billion in grant and contract awards, an increase of 7.1% or $100 million from the $1.4 billion received in FY 2013. Since 1980, the state's two largest non-profit research institutions, the Fred Hutchinson Cancer Research Center (FHCRC) and the Pacific Northwest National Laboratory (PNNL) have together attracted more than $25.6 billion into the state. 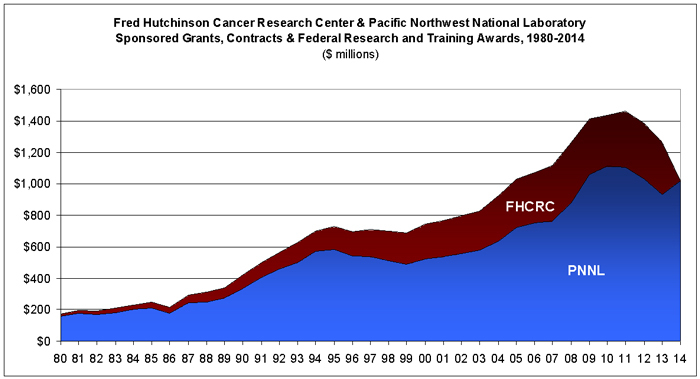 During FY 2014, the FHCRC and PNNL received a total of $1.333 billion in grant and contract awards, an increase of +5.3% or $68.0 million from the $1.265 billion received in FY 2013. In 2014, the state’s two largest universities and more than thirty non-profit organizations together brought more than $3.4 billion into Washington State -- mostly federal research and training awards, a decrease of $500 million or 13 percent from the $3.9 billion received only two years ago. It should be noted that funding in 2014 for the state's four leading universities and non-profit organizations, which totaled $2.9 billion, is essentially the same level of funding reported in 2009. 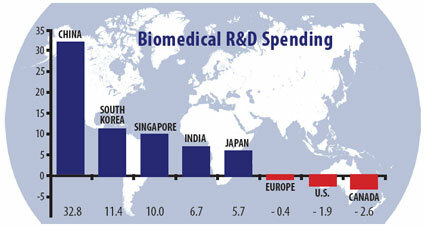 From 2004 to 2012, the rate of investment in medical research in the U.S. has declined, while there has been an increase in research investment globally, particularly in Asia, according to a study published in the Journal of the American Medical Association. According to the study, from 1994 to 2004, the medical device, biotechnology, and pharmaceutical industries had annual growth rates greater than 6 percent per year (Asia's Ascent - Global Trends in Biomedical R&D Expenditures," New England Journal of Medicine, Jan. 13, 2015).